In basement excavation and shoring. Know also as CFA. A machine driven auger that drills holes and when withdrawn, grout or concrete is pumped into the hole through a hollow center. When withdrawn fully A rebar cage is inserted into the wet concrete. The process is repeated many times to form a continuous shield or secant pile wall. Also known as Tangent, Soldier and Contiguous pile walls. A grout or reinforced concrete retaining wall made by the CFA system..
An auger used for drilling circular holes in the ground. Usually machine mounted and hydraulically driven. A made up cage of reinforcing steel main bars held in place by smaller bars. The above photo is of a building site in Brussels, Belgium, that is very close to a main road and other buildings. 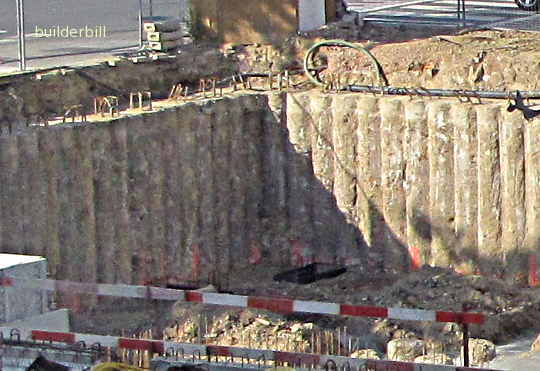 The walls of the excavation are know as secant pile wall. CFA would have been used here probably because of one of the main advantages of this system over other methods of providing a retaining structure for the basement construction work, which is that CFA is vibration free. Modern CFA rigs are capable of drilling up to 20 metres deep and at the same time can be equip ed with sensors that can give readouts of geotechnical information. This gives the site engineers accurate data on the actual bearing capacity of the system. 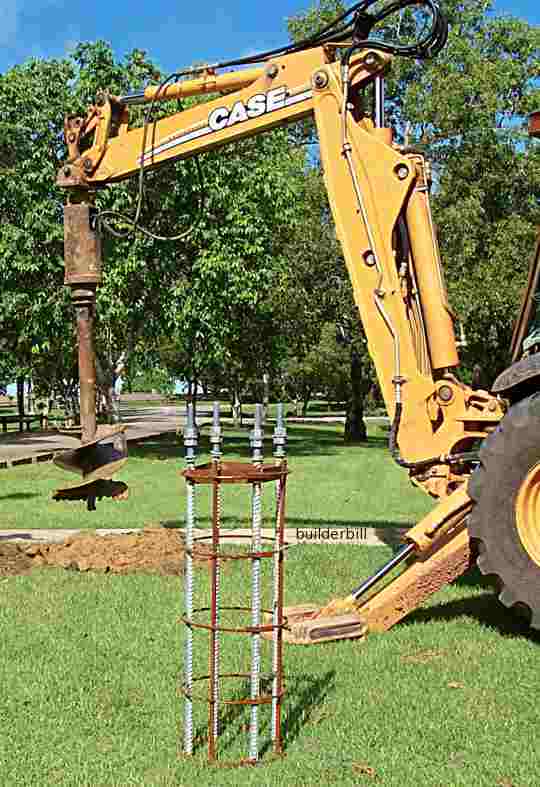 Just as an illustration of the term earth auger, and nothing like a CFA unit, here is a backhoe mounted hydraulic earth auger that is being used to drill foundation holes for lighting poles. The rebar cage is in the foreground, partly made up of galvanised hold down bolts.